Pinnacle Students Learn Valuable Banking Skills | The Pinnacle P.O.V. As students begin to enter the workforce, it is very important for them to learn financial responsibility. There are many skills that people, including students, need to learn when they become the keepers of their own money; everything from developing and balancing a budget, to understanding your credit score. In an effort to help our students become better prepared for their financial future, staff from our Casa Grande campus organized a class to teach students about the banking system. Stephanie Cave, from the Pinal County Federal Credit Union, was invited to lead the class and teach our students how to successfully manage a checking account. After a small tutorial, the students were able to write and endorse checks, complete deposit slips, and practice keeping a register. 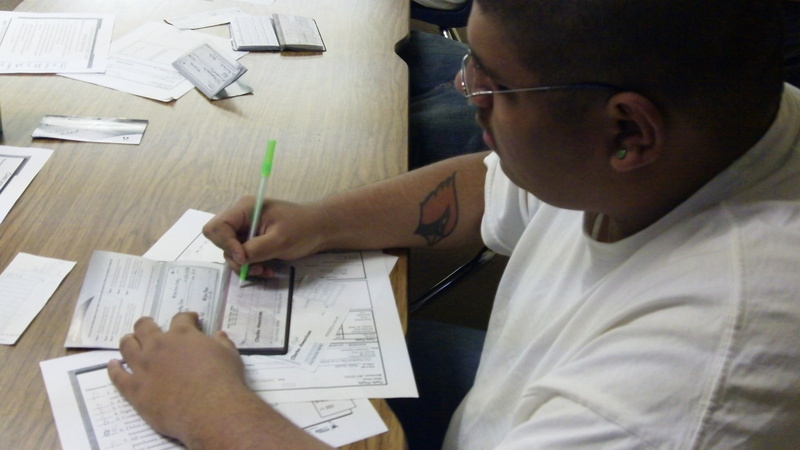 Overall, the students gained valuable knowledge and practice on what it takes to maintain a checking account. The information and banking skills they learned will go a long way in helping our students effectively manage their money. While it may seem hard at first, it won’t be long before our students become experts themselves. Thanks again to Stephanie for coming out and sharing this with our students! ~ by pinnaclepov2224 on April 26, 2010. Learning how to run a basic checking and savings account are important skills for all age groups to pick up.